Switch K is closed and open switch K2. At the closure of K, the ammeter shows a high intensity that decreases rapidly and the meter reads zero in the closing of switch K, and the voltage UC believes follows rapidly. After a while the current I is zero and the CPU voltage is maximum, mean UC = AU. It is said that the capacitor is charged. Early in his charges a capacitor acts as a zero resistance (short circuit). So we have: UC0 and I0 = AU / R, I0 is maximum. End of charging a capacitor, it behaves like an open circuit and UCF If = 0 = AU. 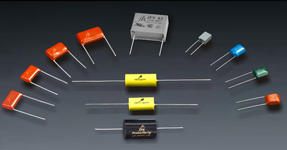 A capacitor whose forms are not connected to any circuit retains its charge and maintains a constant voltage across its terminals. The curves obtained are as follows. Switch K is closes and open switch K2. At the closure of K, the ammeter shows a high intensity that decreases rapidly and the meter reads zero in the closing of switch K, and the voltage UC believes follows rapidly. The time to charge and discharge is based on the knowledge of the amount Ø R.C. called time constant. If R in ohms; C F; Ø s.
Theoretically the charge or discharge a capacitor never end if we do not cut the circuit. Calculation shows that after a time 3Ø a capacitor that load reaches 95% of the yield stress and only after the same time a capacitor which discharges has more than 5% of its initial voltage . These percentages are 99% and 1% respectively at the end of a time 5Ø. We can consider that after 5Ø a capacitor that is charged is fully discharged.